Print a hard copy! Art is fleeting… especially NOW! Art is fleeting… especially NOW! Human creativity is on display now, at this moment, more so than at any other time in human history. Computers are everywhere and creative people are writing and creating images at a rate unheard of, ever before. … and yet: it is fragile and the actual “existence” of it is not real. I am an older fellow, 63 years old as of this writing, and I was a young man before computers became normal in our society. 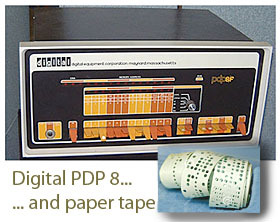 Just out of high school in 1970 I met my first office computer, a file cabinet-sized Digital Equipment Corporation PDP 8… a machine with no hard-drive that had to be “booted” manually via a set of toggle switches on its face before you could feed-in your punched paper tape to run your program. By that time, millions of hours of labor across the Western world had been saved as perforated paper tape for computer input. 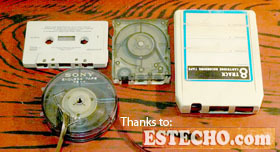 I used it, so much, that I got to where I could read the punched holes of the 6-level tape, myself! My college had an IBM 360 system set up inside a special clean-room environment for which I punched IBM cards as I learned to use the programming languages of FORTRAN and COBOL. In 1974 I bought my dad the first LED pocket calculator he ever owned… in 1977 I bought a spinning-disc phototypesetting machine that recorded keystrokes on an 8-inch floppy disc. The output from that machine was photo-print paper which we bought by the roll… 10-inch by 300-feet, something like that, and processed through our dedicated film processor using a developer solution, a fixer solution and a water-rinse, giving us a page of type in crisp B&W. Later computers used 5-1/4” floppy discs… and newer ones used 3-1/2 floppies… Zip-drives… and internal hard drives. Then came the day when you could record info to a CD on your computer… and then to DVD’s… and now to Blu Ray. … and in home entertainment, don’t forget LP records, 8-Track tape, Cassette tapes, VHS tape, laserdiscs, and CED discs… Atari, Sega and NES game cartridges. The upshot of all of this is the constant march of technology… is leaving the older systems in the dust! If today you found a file drawer full of punched paper tapes, there would be nothing you could do with it. Who knows what words of wisdom are in that trash heap? Whatever it was… is essentially: gone. 3-1/2” floppies were very popular for quite a few years… but now you have to buy a special drive for them, if you even care to do it… and I do have a zip-drive and zip-discs, but I will never power-it up. All of the billions of pages and images saved to those floppies through the 1980’s and 90’s is almost unrecoverable since no one can run them on today’s systems. PLUS… operating systems and softwares have evolved, as well… so even if you COULD open that old floppie, do you have the software to read it? 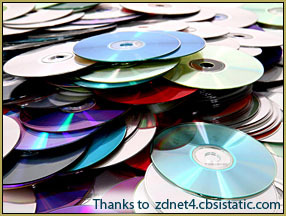 Are CD’s headed into a similar extinction? Will our software evolve away from being able to open a CD? Today’s artists are saving their images to their hard drives and allowing “the cloud” to back them up… making your art images even more ethereal than ever! Should the cloud fail… or another “dark ages” descend upon us… that data will be lost. 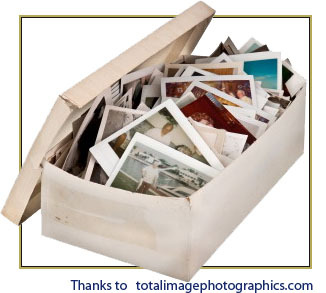 As a child, my family always had a carton of family snapshots and photos that we could paw through whenever we wanted to see some pictures of our family or scenes from past events… camping trips or excursions to Disneyland. No computer or device was required; we would just rummage-through the box of photos. Many people saved the film negatives from their cameras as well as the photo-prints… so they could make more prints later and have something to save for the future… Today’s people take more photos than ever before… but the pictures are saved in cell phones and on computer hard drives and eventually “the cloud”… and no one ever sees them… will never see them… again. … How sad! 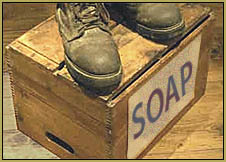 Crank up that printer or stop by the photo-counter at the local big-box store and print your photos and images. Office supply stores and copy shops have large-format color printers allowing you to print your computer-generated art at full size! … You can print the pictures taken at your graduation… at your wedding… of your newborn child… of your latest MMD comic… and have them in-hand to look at and to show to your family and friends regardless of technology’s relentless march into the future. MMD NyaReimu dances to Miku's "The World is Mine"
But yeah my dad operated an IBM 360 too. His colleague at the time was also able to read punchtapes by hand. I really love the history of computing. Thank you for that nice letter! 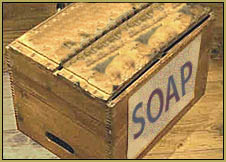 … funny the soft-spot we get for old technology. I am still enjoying my Laserdisc player… my VCR… right next to my BluRay player… and I still have a cassette deck AND a Pioneer component 8-track deck in my stereo rack.